On June 10, 1967, Israel and Syria agreed to a United Nations-brokered cease-fire, ending the Six-Day War. 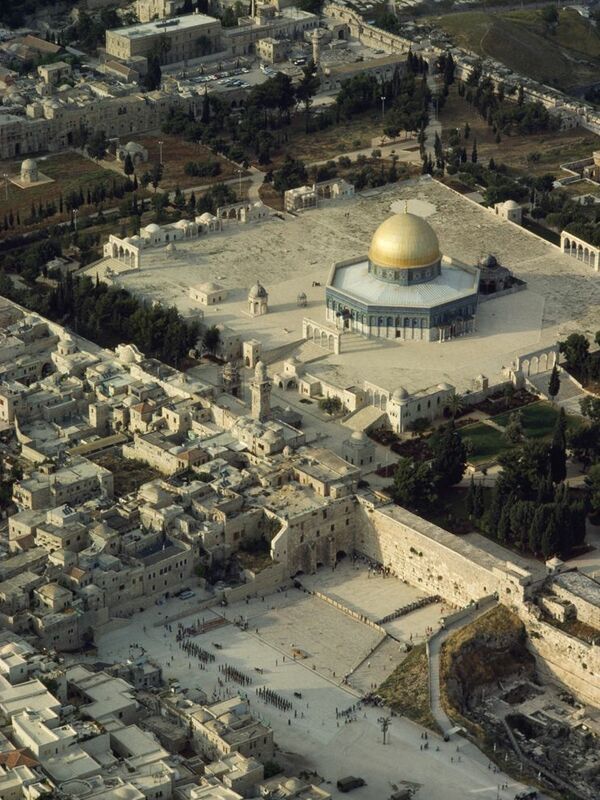 The Temple Mount, in Jerusalem, Israel, is home to the Dome of the Rock and the Wailing Wall. The Dome of the Rock (the gold-domed structure above) is a mosque, a place of worship for Muslims. The Wailing Wall, visible in the courtyard directly below the Dome of the Rock, is a sacred place for Jews. Although separated by less than a kilometer (under 0.6 miles), the religious boundaries between the two holy places is immense. On June 10, 1967, Israel and Syria agreed to a United Nations-brokered cease-fire, ending the Six-Day War. The war was fought between Israel and its neighbor nations: Egypt (then called the United Arab Republic), Jordan, and Syria. It ended in a decisive victory for Israel. By the end of the Six-Day War, Israel captured territory that triples the size of the nation: The Sinai Peninsula and Gaza strip from Egypt, the West Bank from Jordan, and the Golan Heights from Syria. Israel returned the Sinai Peninsula to Egypt in 1979. Today, Gaza and the West Bank make up Israel’s Palestinian Territories, under the political control of the Palestinian National Authority. The Golan Heights are still claimed by Syria. Israel, however, maintains military control of both the Palestinian Territories and the Golan Heights. able to make decisions with certainty.